Murray-Ryan budget deal erases and ignores sequestration. 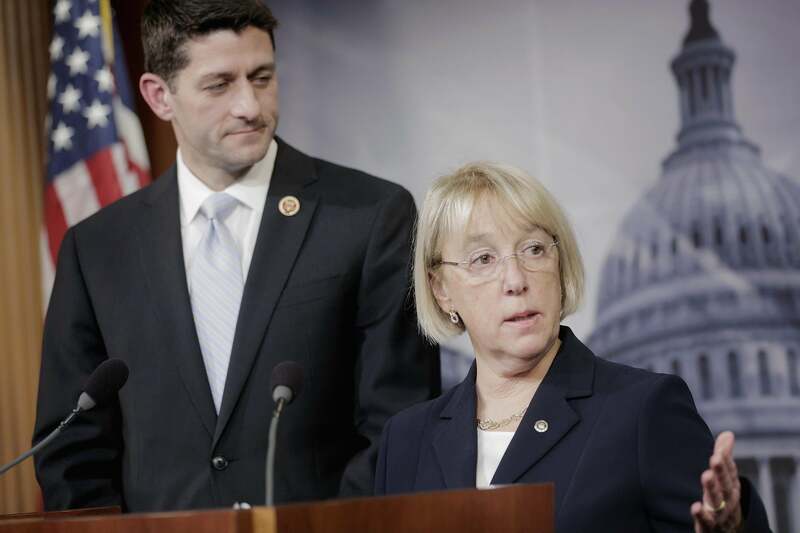 Patty Murray, D-Wash., had an easier time of it than Paul Ryan, R-Wis.
Habemus budgetum! Shortly after 6 p.m., House Budget Chairman Paul Ryan and Senate Budget Chair Patty Murray emerged behind the Senate studio podium and revealed the budget they and the conference committee had hammered out. Conservatives have warned that any budget that spent more than the sequestration limit—$967 billion—would be throatily opposed by them. This budget would spend $1.012 trillion. So Ryan (and to a lesser extent, Murray) would spend the 17-minute press conference explaining what was in the budget and why they had not sold out. This was easy for Murray: Her Democrats had prevented any cuts to Social Security or Medicare, the sort of entitlement reforms that the pundit class had been crying for and crying for. Ryan had a tougher time of it. “In divided government, you don’t always get what you want,” he said. “We eliminate waste. We stop sending checks to criminals. We cut corporate welfare. We start making real changes to these autopilot programs that are the real drivers of our debt.” Twice he was asked how he would defend the plan to Republicans in the House and to conservative groups. Ryan wouldn’t promise or predict the support of his whole party, or even 217 members of it. And he never had to explain how “it raises no taxes” can be comported with the fee increases, such as greater TSA fees for travelers, in the budget. The defense hawks could look at “$63 billion of sequester relief,” and those worried about “automatic spending” could gaze at the new requirements for federal employees to pay more of their own money into pensions. That would add up to $6 billion for federal employees, $6 billion for military members. The deal did not raise the debt limit (“that’s another press conference!”), or tackle expiring unemployment insurance. “The key is, nobody had to sacrifice their core principles,” said Ryan. The condemnations would roll in from the various good-government groups that had been demanding entitlement cuts, and from the conservatives who had attacked the idea of a budget that broke the spending caps. But first, Murray and Ryan shook hands. UPDATE: The outline of the budget is up here, and our usual holdouts in Congress are already worrying the tax/fee question.